A California Condor is a bird with a wingspan almost as long as a Mini Cooper automobile. And the story of their return from the brink of extinction can make nature lovers go all misty-eyed when they hear it told. It's quite an exciting moment when you see one or more of these massive birds soaring over the California landscape. This article includes all the places you can go to California to see them. And you can do that any time of year. The big birds don't migrate, although they move frequently within their growing territory, especially between Pinnacle National Park and Big Sur. The best place in Big Sur to see California condors is near the flagpole at the Julia Pfeiffer Burns State Park entrance. Or look for them riding thermal updrafts along the cliffs between there and the town of Big Sur. 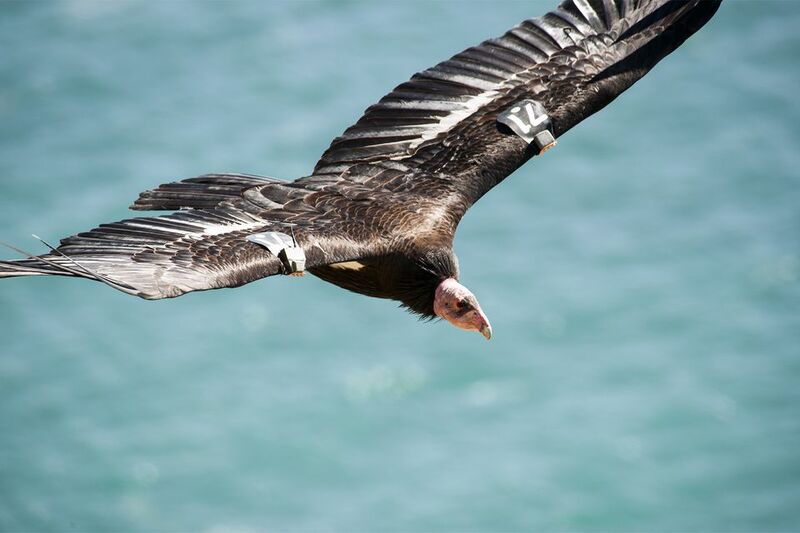 The Ventana Wildlife Society offers guided condor tours the second Sunday of the month. They also host full-day trips that include a visit to the condor base camp. Their guides use radio signals to track the birds, giving you the best chance of seeing them. The Ventana Wildlife Society also operates a very fun to watch Condor Cam, with a view of a remote site where the big birds hang out. Check out the Condor Cam here. Almost two dozen California condors live at Pinnacles National Park, which is accessible through Hollister or Soledad. The most likely place to see them is the High Peaks in the early morning or early evening, but it's a strenuous hike to get there. You may also see them on the ridge just south of the campground, where they soar on morning thermals along the ridge and roost in the trees. Outdoor outfitter REI offers hiking tours to see the condors in Pinnacles National Park. The Sespe Condor Sanctuary in Los Padres National Forest is where the first releases of captive-raised California condor chicks happened in 1992. To help them keep thriving, it's closed to the public, but you might see the birds flying when you drive on CA Highway 33 near Ojai. The Los Angeles Zoo has been very active in condor conservation efforts, hatching more than 100 birds. However, they do not keep any of them at the zoo itself. Learn about the Los Angeles Zoo's conservation efforts. The San Diego Zoo was the first facility in the world to hatch a California condor. You can see California Condors on display at their Safari Park. In 2007, the Santa Barbara Zoo became the second place in California where the general public can view the condors. California condors are free-ranging, wild creatures and sometimes they just don't show up, no matter where you are or how much you want to see them. California condors are easy to identify. Their 9-foot wingspan is almost twice as wide as a turkey vulture. When gliding, they don't wobble, and they are so black that they look like someone drew them with a felt-tipped marker. You may also see identification bands on their wings. Bring binoculars. You can see them better. Photographing moving birds is difficult. Practice "panning," following birds with your camera before you go and remember: don't stop following when you press the shutter. The California Condor (Gymnogyps californianus) is the largest flying bird in the Western Hemisphere, with a wingspan up to almost 10 feet (3 meters). Adults are more than 4 feet (1.5 meters) long and weigh up to 30 pounds (13 kg). Condors live almost as long as humans, up to 60 years, but in the late 1980s, the species' fate was in question. With the wild population down to twenty-some birds, scientists took the bold step of collecting all the remaining animals. In 1987, the last wild condor joined 26 others already in captivity. In 1992, the first birds were placed back into the wild. In 2008, wild California condors outnumbered those in captivity for the first time in over 20 years. Today the population is well over 400 worldwide. They ive California, Utah, Arizona, and Baja, Mexico.